I don’t understand why these Sontarans count as new monsters, but this is an excellent Eighth Doctor story, overshadowed by the Time War and enhanced by great guest characters. This is one of those adventures where three people who don’t entirely get along are forced to work together for survival, gradually uncovering one another’s secrets and forming shifting alliances as they proceed. For the most part, they’re struggling in a blasted hellscape, and there’s a lot of scrapes and narrow escapes, but by the end their actions will have a direct bearing on the fate of the planet. The three-hander works really well, thanks to the strong casting of Dan Starkey (Sontaran expert) and Josette Simon (Dayna of Blake’s 7, and hoo boy I’d forgotten how much I loved her voice). Paul’s Doctor at his most clever and eloquent, wriggling his way out of scrapes with his wits and his screwdriver. Josette’s character Sarana is a steel-willed woman who falls easily into the companion role yet keeps subverting it. And Commander Jask is an unusually well-rounded Sontaran character, representative of his species yet far more than a caricature. This is the most nuanced portrayal of Sontarans that I’ve heard or seen so far, getting at the heart of their honour and their politics much in the way that later iterations of Star Trek fleshed out the Klingons. Perhaps new Who has done that in episodes I haven’t seen yet; so far I’ve only seen Strax played for comic relief. Since I haven’t caught up with recent Eighth Doctor and War Doctor audios, this is my first glimpse of the Time War, and it is suitably terrifying. Eight’s anguish and anger at his own people is palpable. 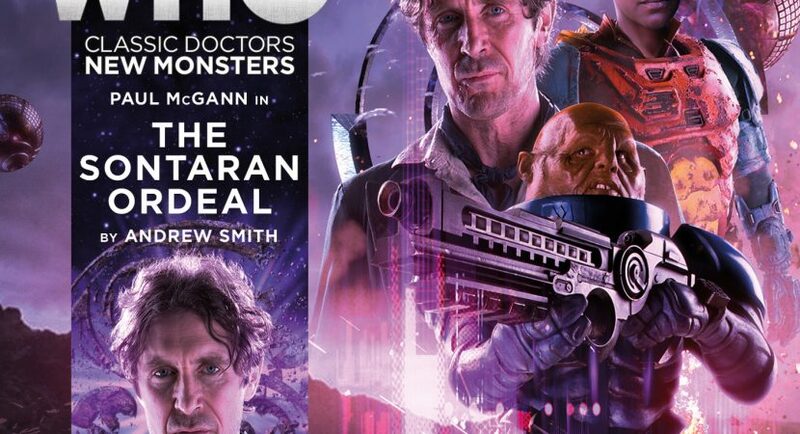 It’s fascinating and exciting having Big Finish convincingly bridge the gap between classic Who and new, a difficult job which Paul McGann has tackled with aplomb. Most of all, I love the character of Sarana, whose motivations, strengths and weaknesses, and difficult relationship with the Doctor give this story a lot of heart and a complicated ending. It’s a well-rounded tale. Maybe it’s easier to put Eight into a 50-minute format, because so many of the Eighth Doctor Adventures are of a similar length. Whatever the reason, it was one of the better Eighth Doctor audios I’ve heard in some time (since I’m stuck back at the end of the Divergent Universe arc). Not really a spoiler, but it was mildly amusing having one of the warring nations named what sounded like Barrowman.